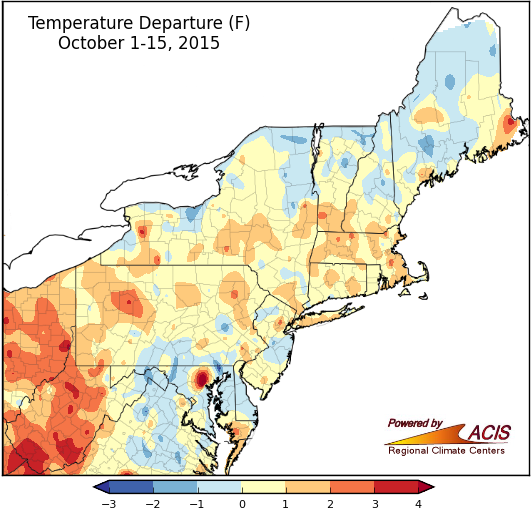 Temperatures during the first two weeks of October ranged from around 1°F below normal to more than 3°F above normal. Midway through fall, temperatures were more than 2°F above normal. Most of the Northeast saw near- to above-normal temperatures during the first half of October, thanks in part to a very warm Columbus Day. Temperature departures ranged from around 1°F below normal to more than 3°F above normal, with West Virginia being the warmest spot. At the 35 major airport climate sites, departures ranged from 0.5°F below normal in Washington, DC to 2.8°F above normal in Beckley, WV. 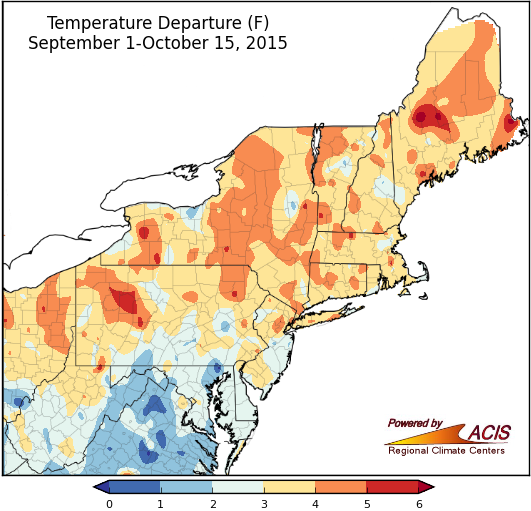 With the exceptionally warm September, it’s no surprise that the fall season so far has also been warmer than normal. For most areas, the first half of fall was more than 2°F above normal. 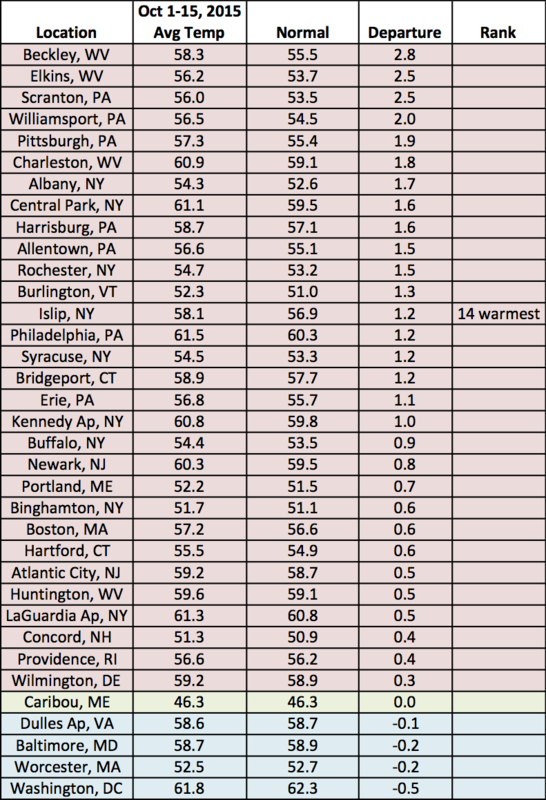 Twenty-two airport climate sites ranked the period among their top 10 warmest, with Burlington, VT being record warm. 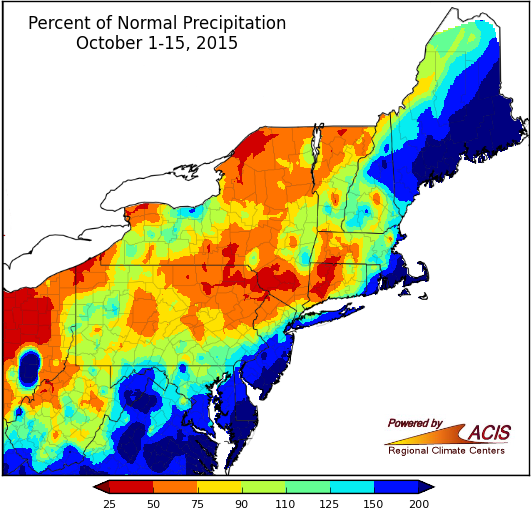 In mid-October, precipitation ranged from less than 50% of normal to more than 200% of normal. 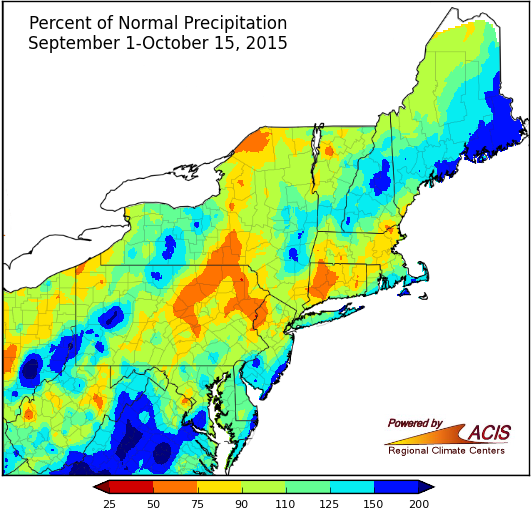 Precipitation during the first half of fall ranged from 50% of normal to 200% of normal. October precipitation has been variable, with inland areas quite dry and the Mid-Atlantic and many coastal areas quite wet. 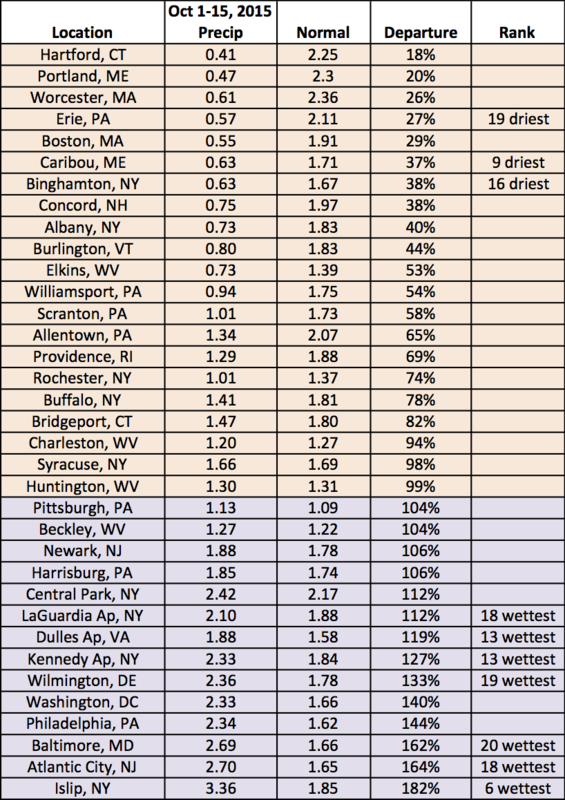 Precipitation ranged from less than 50% of normal to more than 200% of normal. 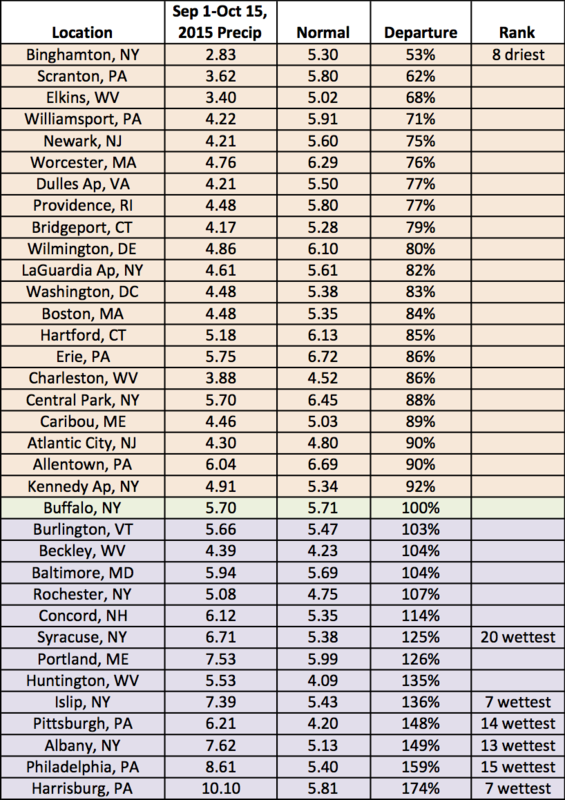 At the airport climate sites, precipitation ranged from 18% of normal in Hartford, CT to 182% of normal in Islip, NY. Precipitation during the first half of fall was also variable, ranging from 50% of normal to 200% of normal. 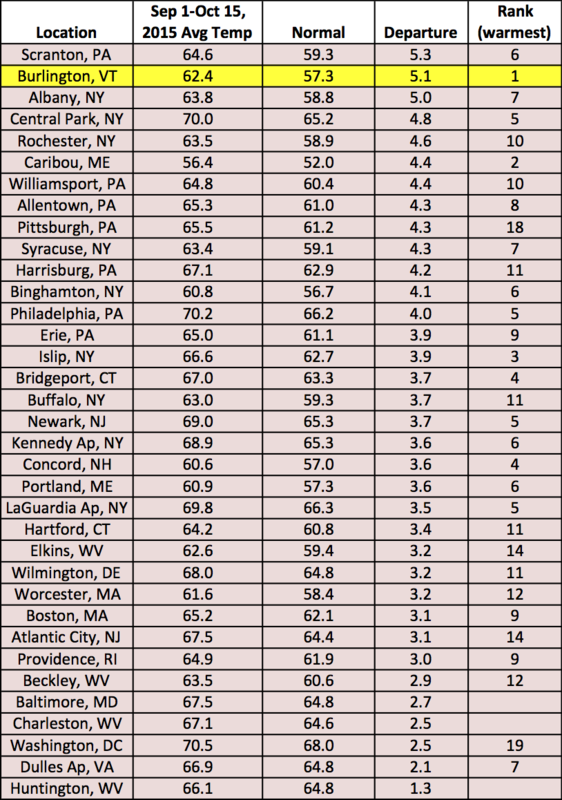 At the airport climate site, precipitation ranged from 53% of normal in Binghamton, NY to 174% of normal in Harrisburg, PA.
With fall halfway over, people are wondering what this winter will be like. On October 15, the Climate Prediction Center released their official winter forecast, which calls for an increased chance of above-normal temperatures for almost the entire region. As for precipitation, the Mid-Atlantic and areas near the coast have an increased chance of above-normal precipitation, while equal chances of below-, near-, or above-normal precipitation was forecast for inland areas. CPC’s winter outlook indicates an enhanced chance of above-normal temperatures. As for precipitation, CPC calls for an increased chance of above-normal precipitation for coastal areas and equal chances inland.